Figure 1. 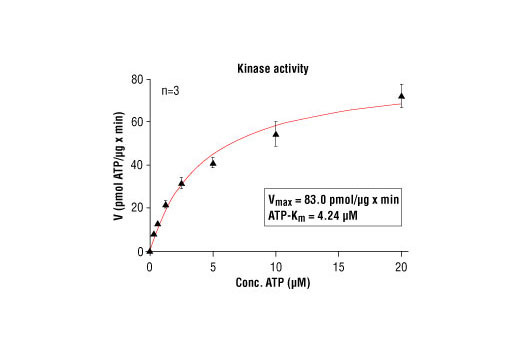 CSK kinase activity was measured in a radioisotopic filter binding assay using the following reaction conditions: 60 mM HEPES-NaOH, pH 7.5, 3 mM MgCl2, 3 mM MnCl2, 3 uM Na-orthovanadate, 1.2 mM DTT, ATP (variable), 200 ng/50 µl PEG20,000, Substrate: Poly(EY) 1 ug/50 µl, recombinant Csk: 4 Units/50 µl. 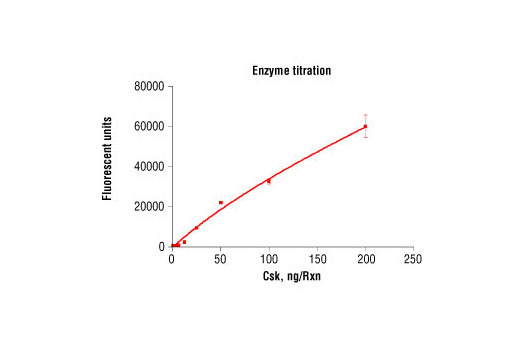 The kit provides a means of performing kinase activity assays with recombinant human Csk kinase. 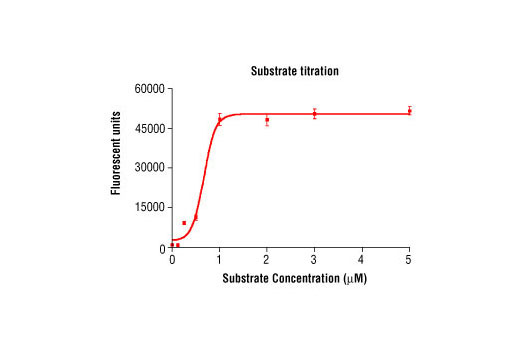 It includes active Csk kinase (supplied as a GST fusion protein), a biotinylated peptide substrate and a phospho-Tyrosine monoclonal antibody for detection of the phosphorylated form of the substrate peptide. Peptide substrate, Biotin-peptide: 2,290 Daltons, GST-Csk Kinase: 80 kDa. Carboxy-terminal Src kinase (Csk) is a ubiquitously expressed nonreceptor tyrosine kinase that negatively regulates the Src family kinases (SFKs) by phosphorylation of the SFK carboxy-terminal tyrosine (1,2). Phosphorylated carboxy-terminal tyrosine binds to the SH2 domain of SFK intramolecularly and leads to folding and inactivation of the SFK (3). 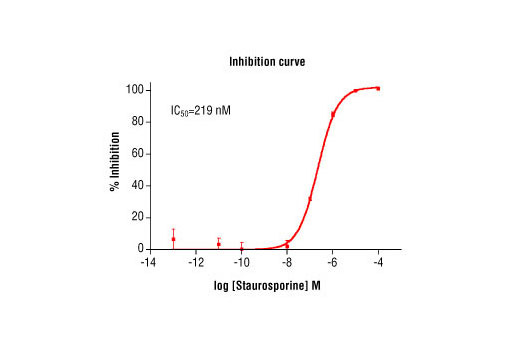 This Csk-catalyzed SFK tyrosine phosphorylation is highly specific and exclusive. The SFK carboxy-terminal tyrosine is the only known physiological substrate of Csk (4). Csk consists of an SH2, an SH3, and a kinase domain. There is evidence that the SH2 and SH3 domains are essential for the regulation of SFK, and Csk can be recruited to the membrane where SFKs are in an active state. This process is mediated by a Csk-binding protein (Cbp, also called PAG), which binds tightly to the SH2 domain of Csk (5). Activation of SFK by extracellular stimuli leads to the tyrosine phosphorylation of Cbp, generating docking sites for Csk. The recruitment of Csk forms a feedback mechanism for termination of SFK function (6). Nada, S. et al. (1991) Nature 351, 69-72. Nada, S. et al. (1993) Cell 73, 1125-35. Lee, S. et al. (2003) Proc Natl Acad Sci U S A 100, 14707-12. Imamoto, A. and Soriano, P. (1993) Cell 73, 1117-24. Kawabuchi, M. et al. (2000) Nature 404, 999-1003. Matsuoka, H. et al. 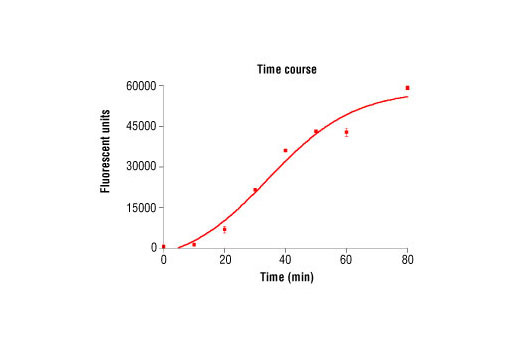 (2004) J Biol Chem 279, 5975-83.